As a child and young adult, I loved being able to design and sew clothing. I often wished I had the means to create my own fabrics so that my designs could be truly original, but I got busy being and the question was set aside. Years later, when I discovered weaving, I realized my wish had been granted. Weaving offered me the opportunity to select the raw materials and choose the colors and combine them to make cloth that is truly one of a kind. 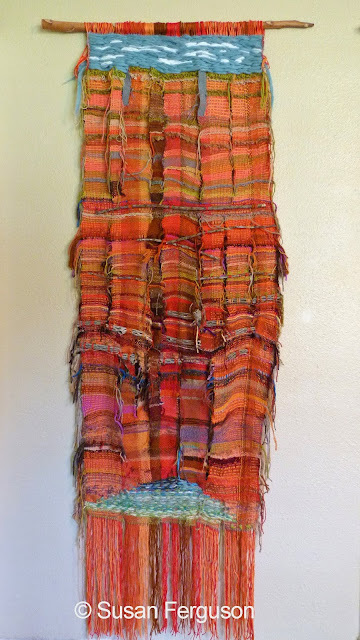 When I first began weaving, I created many decidedly safe and predictable rectangles. That didn't last long. 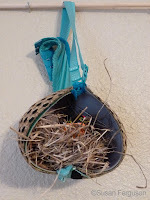 I became intrigued by Saori and Sakiori weaving and by the use of recycled materials. 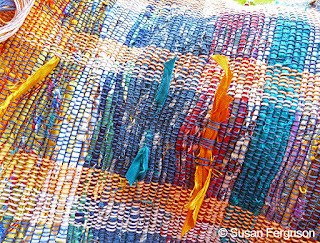 I explored the chaos of odd color and fiber combinations and the impact of traditional and non-traditional elements. I experimented as any reasonable person would. My mentor often smiled and urged me to continue making pieces that were symmetrical and uniform and utilitarian. One afternoon I asked her how one would go about weaving several narrow strips side by side simultaneously. She looked at me and said in all seriousness, "Why would anyone want to do that?" She then showed me a woman's suit jacket she had woven. That ended the question-asking for both of us. 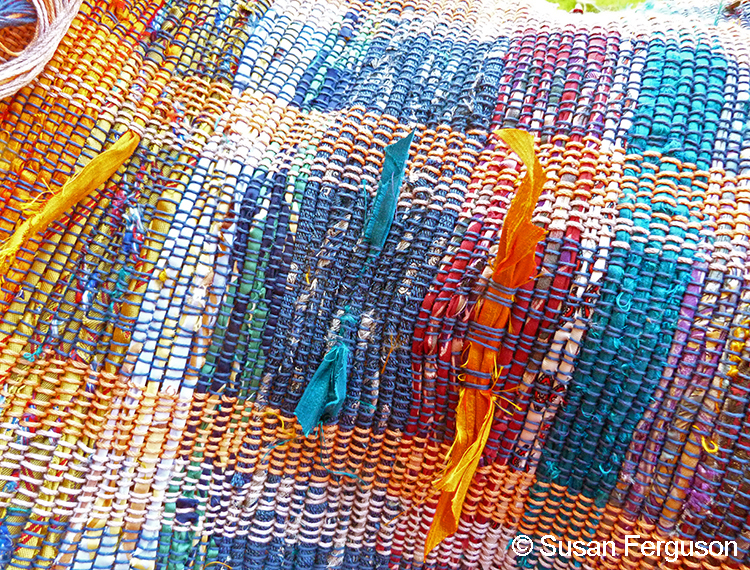 Weaving and fiber art have shown me a positive, meditative path of self-discovery and self-reflection. My intention is to create works that reflect my interests in the natural environment, personal identity and emotional health. I work at a rigid heddle loom, doing plain weave with either a shuttle or with my fingers. Imagination and hope drive my selection of fibers and colors. The pieces I create are often messy, with untrimmed strands of yarn dangling everywhere. I favor the unkempt, asymmetrical form; it reflects how I see and navigate through the world. My work is influenced by the concept of abstract expressionism. I am awestruck by the works of Juliet Martin, Terri Friedman, Josefina Pellegrini, Dorothy Clews, Elise Vazelakis, Rowan Schussheim-Anderson, Jackson Pollack, Robert Rauschenberg and Jeffrey Jonczyk.